MAKES YOUR PROJECT SOUND PRO! Do the very best mix you can! Send us the same format you recorded and mixed in. If you recorded at 16-bit/44.1kHz then send us a stereo .wav or .aiff file at 16-bit/44.1kHz resolution. If you recorded and mixed at 24-bit/48kHz then send in that format. Allow 3 to 6 db head room. Mastering is the final step in the recording process; "the icing on the cake!". Mastering gives your stereo mix that glossy, professional, radio-ready sound. Mastering imparts a consistency so your song sounds great across all playback platforms. If you are offering songs on a Soundcloud type site or making a CD, mastering makes volume and presentation consistent song to song. Mastering helps your song achieve the coveted "loud as possible" status desired by most of today's artists. Mastering puts a fresh set of professional ears on your project. Changes can be made to even the sonic balance of your track or even add subtle effects to make your mix even better. Just Dropbox us your stereo .wav mix to nashtrax@bellsouth.net , pay via Pay Pal to nashtrax#bellsouth.net and we will complete your mastering job, usually within a few hours.. 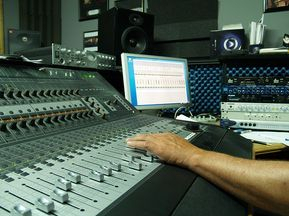 COST: Independent Songwriter, Producer or Indie Label: $75 per song for one or two songs up to 6 minutes long average per song, $55 per song for 3 or more songs. Custom or Major label work $250 per song, $200 per song for 4 or more songs. If over 5 minute per song average Contact us at nashtrax@bellsouth.net for a quote. Include:Type of music, length of the song purpose(s) of the mastering job? Multi-purpose? CD? Radio? Television? Streaming? Never "hit the red", keep your master channel it below o db to avoid clipping a.k.a. distortion which is is a "fuzzy" sound on your mix and only gets worse in mastering. It's best to mix with the master channel hitting between -3 and -6db. Do NOT add any effects to the master buss. We prefer to receive your mix as a .wav or high quality .mp3 file.